MANILA, Philippines - (Updated November 2) The October 2017 CPA board exam results including the list of passers, topnotchers (top 10), top performing schools and performance of schools are officially released on November 2, 2017 or in ten (10) working days after the last day of exam. UPDATE: 4,511 out of 14,816 passed the Certified Public Accountant (CPA) exams. The results of examination with respect to three (3) examinees were withheld pending final determination of their liabilities under the rules and regulations governing licensure examination, PRC said. 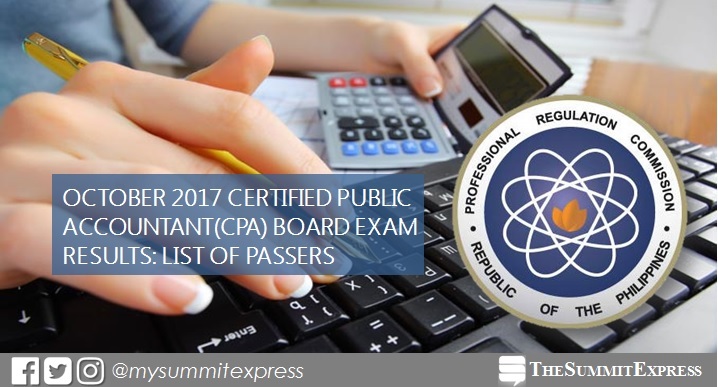 The Professional Regulation Commission (PRC) conducted the CPA licensure exam in the cities of Manila, Baguio, Cagayan de Oro, Cebu, Davao, Iloilo, Legaspi, Lucena, Tacloban and Tuguegarao on October 7, 8, 14 and 15, 2017. UPDATE: The BoA said to release the official oath taking program on the oathtaking day. Aside from the list of all the passers of the Examinations, the top performing school and the top ten topnotchers, the program will also contain pictures and write ups on important BoA accountancy events and activities. October 8: Auditing (removal and first timer), auditing theory (removal) and theory of accounts (removal). According to PRC Resolution No. 2016-1019, the target release of results for the recent CPA board exam is on Wednesday, October 25 or in 6 working days after the test (8 days on original assumption). Note that government work was suspended on Monday and Tuesday (October 16 and 17) due to nationwide transport strike. In the same period last year (October 2016), results were released online in eight (8) working days after the exams. PRC named 5,249 out of 14,390 (36.48%) who have succcessfully hurdled the exams. In October 2015, results were announced in four (4) working days. A total of 5,468 out of 13,317 (41.06%) passed the series of tests.